Tomorrah is a hillbilly that has to get grub to feed his wife (his cousin's mom's father's daughter's daughter) and their 27 children! There's FREE food at the farmer's market, but only the food that has gone rotten. 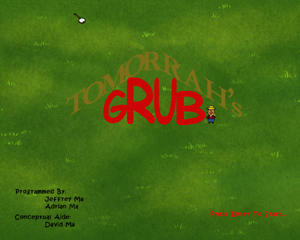 Stock up on Tomorrah's grub, today! Tomorrah is the farmer with the YELLOW hat. Pick up the rotting food (red) and fling it into your GRUB basket. Don't fling the fresh food or the vendors will getcha! Aiming the food is tricky. After you pick up a food item, hold the left mouse down. 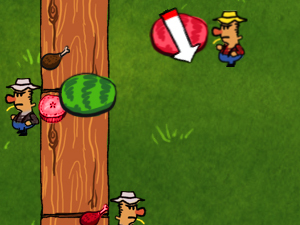 An arrow will appear that shows you where the food will be flung, and with how much power (more red = more power). Moving the mouse will turn the arrow and increase/decrease the power. You need to aim for the GRUB basket, and select the perfect amount of power (don't overshoot or undershoot). If you fling your food very close to the GRUB basket, you don't have to worry about power. Heavy Install - XNA Game. 4. Download Game, Unzip and double click "TomorrahsGrub.exe". You probably already have DirectX 9 and .NET 2.0 installed thanks to Microsoft Automatic Updates. 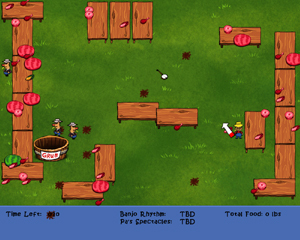 There were 4 other XNA games created at TOJam #2, so it's worth the trouble. Be forewarned, game has significant load times. Your patience is appreciated. Cute Farmers? Spoiling food? Sounds like my local grocery store. This innocent looking game disguises a challenging control scheme. When you finally manage to long distance fling into the GRUB basket, you will feel a great sense of accomplishment.